There are many advantages as well as considerations to buying a sponsor unit in NYC. If your buyer’s agent hasn’t already explained to you the differences in closing costs associated with buying a sponsor unit in NYC, then you should consider getting rid of your real estate agent after reading this article. 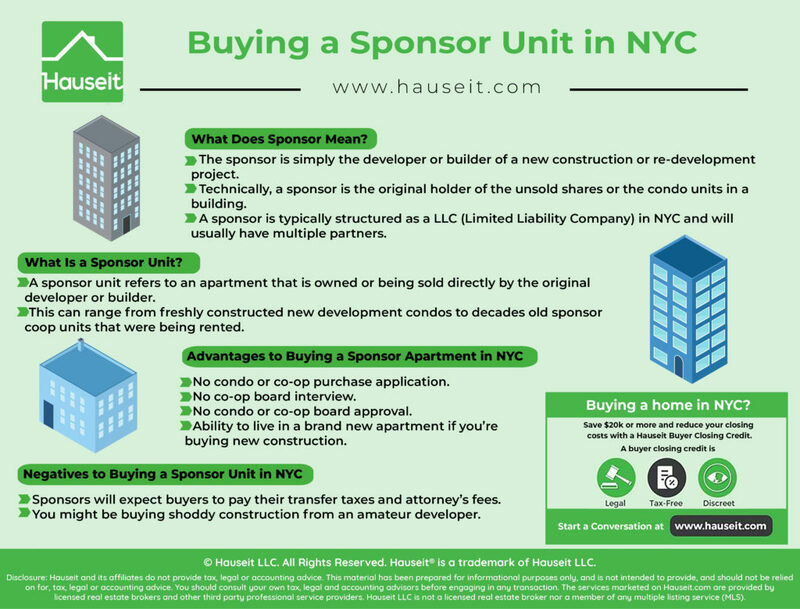 We’ll teach you everything you need to know about buying a sponsor unit so you can make an informed decision before buying a home in NYC. 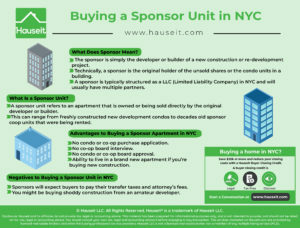 First time home buyers will often be confused by the term sponsor as it relates to buying a sponsor unit in NYC. The sponsor is simply the developer or builder of a new construction or re-development project. Technically, a sponsor is the original holder of the unsold shares or the condo units in a building. The sale of any other unit in the building is technically a re-sale if the owner purchased it from the original developer. A sponsor is typically structured as a LLC (Limited Liability Company) in NYC and will usually have multiple partners.1 Larger development projects may have different layers of financing, all the way from traditional bank loans to EB-5 financing typically structured as mezzanine debt. Even smaller construction projects will often have equity investors who play a passive role. The manager of the LLC may structure what’s called a promote, or incentive compensation, where the manager of the LLC earns a portion of the returns of the investor. For example, the manager of the LLC may allow co-investors into the deal if the manager can earn 35% of the investors’ returns as incentive compensation. 1Buying property in a LLC is the preferred method for many investors as it offers privacy and protection from personal liability. A sponsor unit refers to an apartment that is owned or being sold directly by the original developer or builder. This can range from freshly constructed new development condos to decades old sponsor coop units that were being rented out. So just what is a sponsor apartment? A sponsor unit in NYC will look no different than a normal re-sale apartment. The only difference will be who the seller is. The seller of a sponsor apartment will be the original developer or builder, whereas the seller in a re-sale will be whoever purchased that apartment last. The biggest advantages to buying a sponsor unit in NYC are privacy and convenience. Many New Yorkers are loathe to complete the onerous and extremely invasive coop purchase application. Even condo purchase applications can be delusional these days and ask for multiple reference letters. However, one of the perks of buying a sponsor unit in NYC is that you can skip the standard sales application and coop board interview altogether. Forget about telling your neighbors about every detail of your net worth and personal and professional biography, including any LLCs and secret societies you are a member of. Keep in mind, just because you can skip the regular coop purchase application board package doesn’t mean you can avoid filling out any forms at all. You may still have to fill out a much simpler, often single page form about yourself for the sponsor to have on file. However, it’ll be nothing like the nightmare you’ll encounter with some coop board applications. Did we mention convenience? One of the best things about buying a sponsor unit in NYC is that you can forgo giving up days of your life putting together a massive coop board package. No lengthy forms, multiple collated copies, three ring binders and other nonsense. Yes you may have a form to fill out for the sponsor, but it’ll be much more basic and short if there is one. Furthermore, you don’t run the risk of a discriminatory board, or simply a board that is overly cautious and has too strict coop financial requirements. 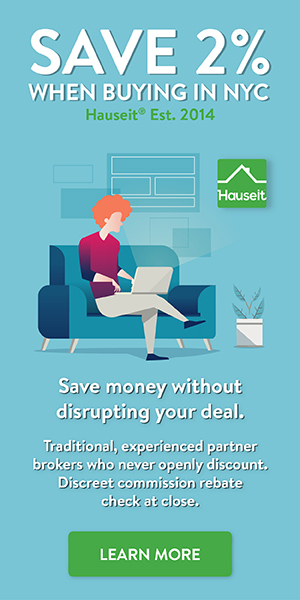 A coop sponsor will simply want to make sure you can afford the apartment, and will usually be alright with looser financial qualifications and a smaller down payment. Furthermore, there won’t be an arbitrary board decision on whether you are approved or not. Remember that coop boards are not required to disclose the reason for a board rejection, so you won’t have to face the humiliation and angst of a board rejection. Furthermore, an added plus of buying a sponsor unit in NYC is the pleasure of living in a brand new apartment. Most sponsor apartments in NYC today are new build condominiums being sold for the first time. As a result, you’ll get the pleasure of being the first person to ever live in a condo sponsor unit. Though rare, new construction sponsor unit co ops in NYC do exist as well. For example, one of our partner brokers recently toured a notable new construction co op in Roosevelt Island. However, no co op board approval coops are more commonly found via unsold shares of an existing coop building. As a result, if you are intent on buying a coop in NYC perhaps because of the lower price point, you may get an older or not renovated sponsor unit co op apartment. The primary downside to buying a sponsor unit in NYC is cost. You’ll be expected by the developer in most market cycles to pay the seller’s NYC and NY State transfer taxes, and possibly other closing costs such as the sponsor’s attorney fees as well. These seller closing costs can add up. Transfer taxes for NYC property purchases can add up to 1.825% of the sale price as of this writing. Sponsor’s lawyer costs usually involve a flat fee, ranging anywhere from $2,000 to $3,000 on average. We tend to see sponsor attorney fees being a bit higher than average, so expect to see a flat fee of $3,000 more often than $2,000. The other potential downside to buying a sponsor unit in NYC is shoddy construction. This risk is especially acute if you are buying a sponsor unit from a small time developer or otherwise inexperienced builder. A smaller developer may not have brand equity in the form of a stellar reputation for quality to protect, and may not be in it for the long run. As a result, you may encounter some amateur developers who are in it for a quick buck. This will happen more in hot property markets where mom and pop builders and house flippers will enter the market to try to earn a quick profit. These types of sponsors may be more liable to cut corners during construction or use shoddy materials because they are not in it for the long haul. As a result, it may be a good idea to get a home inspection done for new construction purchases, even if you are not buying a house in NYC. Calculating the transfer taxes you may pay for a sponsor unit coop purchase can be tricky and beyond the grasp of even many real estate lawyers. The actual amount of transfer taxes owed can surprise even the most seasoned real estate broker if the purchase price of the sponsor sale coop is under $500,000. Let’s assume that your purchase price is $450,000. Most real estate attorneys would assume that you would only owe 1% in NYC transfer taxes because it’s under the $500,000 threshold at which point the tax rate gaps out to 1.425%. Additionally, the buyer would owe 0.4% in New York State transfer taxes. However, what if the building has a $6 million underlying mortgage with 40 total units in the building? Assuming everyone owns an equal amount of coop shares, then the amount of the building’s mortgage attributable to each unit is $150,000. This will be a problem as that $150,000 of building mortgage will add to the consideration or price as it relates to the calculation of transfer taxes. So your total consideration being paid for the purchase of the no board approval sponsor unit is actually $600,000 in the eyes of the city and state government. That pushes you over the $500,000 threshold for NYC transfer taxes, and suddenly you owe NYC 1.425% instead of 1% of the purchase price in transfer taxes. Add the 0.4% still going to NY State in transfer taxes and your total transfer taxes are now 1.825% vs 1.425%! That’s a big difference!